THE HOCKEY SCHTICK: New paper "changes fundamental understanding of how greenhouse warming comes about"
New paper "changes fundamental understanding of how greenhouse warming comes about"
A new paper published in PNAS on the greenhouse effect allegedly "changes the fundamental understanding of how greenhouse warming comes about." Pardon? The paper attributes a role to increased CO2 only during the first couple decades to "start the process," after which "global energy accumulation is primarily caused by an increase in absorbed solar radiation rather than reduced outgoing longwave radiation" [from greenhouse gases]. However, the only way the Earth can warm is by decreasing outgoing longwave infrared radiation in relation to incoming energy from shortwave solar radiation, changing the radiative balance. In addition, any such radiative imbalance in the troposphere would be counteracted by the dominant negative-feedback cooling from convection. Convection dominates over radiative forcing in the troposphere until the atmosphere becomes too thin to sustain convection at P=0.1 bar, i.e. where the tropopause begins and radiative forcing takes over. Above the troposphere, CO2 is well-known to be a cooling, not warming, agent. The real 33C atmospheric greenhouse effect is instead entirely explainable on the basis of atmospheric mass/gravity/heat capacity/adiabatic lapse rate, and the "ocean greenhouse effect" explainable on the basis of the ~0.76 - 0.89 far-IR emissivity of the oceans, which "traps" heat from solar radiation in the oceans. Related: Why global warming is also not explained by a change in "effective radiating level"
"New research suggests global warming is not just a blanket - in the long run, it's more like tanning oil. Climate models forced with CO2 reveal that global energy accumulation is primarily caused by an increase in absorbed solar radiation rather than reduced outgoing longwave radiation." While computer models churn out bleak forecasts for the planet's future, we also have a more conceptual understanding of what is happening as humans pump carbon dioxide into the air. But the conceptual understanding of carbon dioxide wrapping the planet in a blanket that traps more heat is not quite right. A new study from the University of Washington and the Massachusetts Institute of Technology hopes to complete the understanding of what happens to the planet under climate change. Instead of carbon dioxide, or CO2, creating a blanket to slowly warm the planet, a paper this week in the Proceedings of the National Academy of Sciences shows the story is a little more complicated - though the ending is, unfortunately, the same. "This is a neat study in that it changes the way we think about the climate system," said lead author Aaron Donohoe, a postdoctoral researcher at MIT who is now beginning as a research associate at the UW's Applied Physics Laboratory. "We looked at processes that are well captured in the models, but the conceptual understanding of how they work hasn't been fleshed out before." So what keeps the planet warming after the first decade? In the longer term, the study shows that the Earth begins to absorb more shortwave radiation - the high-energy rays coming directly from the sun. Previously people had shied away from talking about shortwave [solar] radiation because clouds can reflect this visible light back to space, and clouds remain one of the big unknowns under climate change. Regardless of what happens to clouds [baloney], these researchers say, the planet is likely to have less ice and the air will become more humid under climate change, both of which will act to absorb more shortwave radiation from the sun. Those effects will be like putting tanning oil on the planet, letting it absorb more of the sun's incoming rays. "While greenhouse gases trap one type of radiation, it's the other type - visible, shortwave radiation - that is really sustaining global warming over the long term," said co-author Kyle Armour, a postdoctoral researcher at MIT who will join the UW faculty this fall with a joint appointment in oceanography and atmospheric sciences. Most of the study's simulations involved a one-time addition of carbon dioxide into the atmosphere. 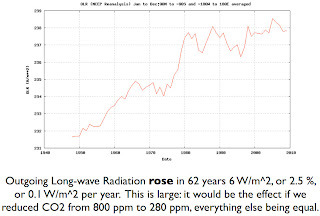 One scenario simulated continuously increasing CO2, as is happening now - in that case, the long-wave radiation effect lasted about 20 years before the shortwave effect took over. "Our results do not change our overall expectation that the planet will continue to warm due to the burning of fossil fuels, but they do change our fundamental understanding of how that warming comes about," said co-author David Battisti, a UW professor of atmospheric sciences. PNAS describes the significance of this research as: The greenhouse effect is well-established. Increased concentrations of greenhouse gases, such as CO2, reduce the amount of outgoing longwave radiation (OLR) to space [observations show the opposite of increasing OLR over the past 62 years]; thus, energy accumulates in the climate system, and the planet warms. However, climate models forced with CO2 reveal that global energy accumulation is, instead, primarily caused by an increase in absorbed solar radiation (ASR). This study resolves this apparent paradox. The solution is in the climate feedbacks that increase ASR with warming—the moistening of the atmosphere and the reduction of snow and sea ice cover. Observations and model simulations suggest that even though global warming is set into motion by greenhouse gases that reduce OLR, it is ultimately sustained by the climate feedbacks that enhance ASR. Abstract: In response to increasing concentrations of atmospheric CO2, high-end general circulation models (GCMs) simulate an accumulation of energy at the top of the atmosphere not through a reduction in outgoing longwave radiation (OLR)—as one might expect from greenhouse gas forcing—but through an enhancement of net absorbed solar radiation (ASR). 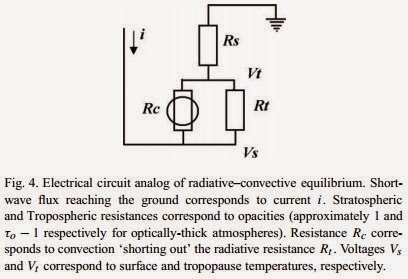 A simple linear radiative feedback framework is used to explain this counterintuitive behavior. It is found that the timescale over which OLR returns to its initial value after a CO2 perturbation depends sensitively on the magnitude of shortwave (SW) feedbacks. If SW feedbacks are sufficiently positive, OLR recovers within merely several decades, and any subsequent global energy accumulation is because of enhanced ASR only. In the GCM mean, this OLR recovery timescale is only 20 y because of robust SW water vapor and surface albedo feedbacks. However, a large spread in the net SW feedback across models (because of clouds) produces a range of OLR responses; in those few models with a weak SW feedback, OLR takes centuries to recover, and energy accumulation is dominated by reduced OLR. Observational constraints of radiative feedbacks—from satellite radiation and surface temperature data—suggest an OLR recovery timescale of decades or less, consistent with the majority of GCMs. Altogether, these results suggest that, although greenhouse gas forcing predominantly acts to reduce OLR, the resulting global warming is likely caused by enhanced ASR. Read the abstract and get the paper here. "a radiation intensity I is not a current density that can be described by a vector feld j(x; t). That means that conservation laws (continuity equations, balance equations, budget equations) cannot be written down for intensities. Unfortunately this is done in most climatologic papers, the cardinal error of global climatology"
So if your paper is doing that, and if I'm correctly interpreting the paper I linked to, then it isn't anything but another faulty model. If it gives the right result, it's just by chance. Sorry, but it just doesn't look right to me. This "new theory" publised in PNAS does not appear to be a general theory of warming but a fix for the failure of the existing theory to account for the mismatch between theory and observations in the middle trophosphere. Whether or not the fix is accepted will not affect the fact that NASA and other scientists in Federal institutes have estimated the uncertainty in the estimate of net energy imbalance to be 34 times as big as the estimate energy imbalance that causes warming. (17 Wm-2 uncertainty compared with 0.5 Wm-2 imbalance). In 2012, Loeb and his team published an update to Hansen's 2011 estimate of the energy imbalance cited by Stephens et al. Observed changes in top-of-the-atmosphere radiation and upper-ocean heating consistent within uncertainty.